The Larson Electronics SL-360-M-R is a 360 degree magnetically mounted beacon that is battery powered and provides up to 94 hours of continuous operation on a single set of 4 AA batteries. This LED Beacon is 100% portable, has a magnet mount base, and provides a highly effective alternative to beacons that require wiring and special permanent mounting. This compact LED beacon contains a 20 LED lamp assembly that produces a brilliant signal visible for extended distances. This LED beacon is red in color and is 100% portable, with a magnetic mount and battery operation that allows it to be operated wherever a powerful beacon is needed. With no need for wiring or external power sources, this light is ideal for applications where a signal light is needed on an occasional or temporary basis such as farm equipment, warehouse equipment, cars or trucks. 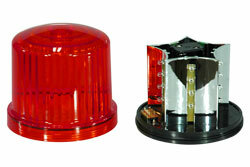 The SL-360-M-R LED beacon is durably built and resistant to shocks and vibrations. The durable housing and lens is designed to provide high strength and a small size, allowing easy placement in tight spaces. Dimensions for the lamp assembly are 5 inches in diameter by 4 1/2 inches high. This strobe flashes once per second and runs continuously for up to 94 hours on a single set of four AA batteries. The durability, portability, and power of this LED beacon make it ideal for towing, forklifts, cranes, trailers, security, warehouses, and anywhere a fast and simple beacon solution with plenty of power is needed. 3. Runs continuously for up to 94 hours on a single set of four AA batteries. 5. Retains 80% lumen output after 60,000 operating hours. 6. 20 LED lamp assembly. In marine locations, searchlights are frequently used to support a wide range of applications, projects and daily tasks. This type of light, which has been around since 1907, can come in spotlight beam configurations as well as infrared for nighttime viewing.